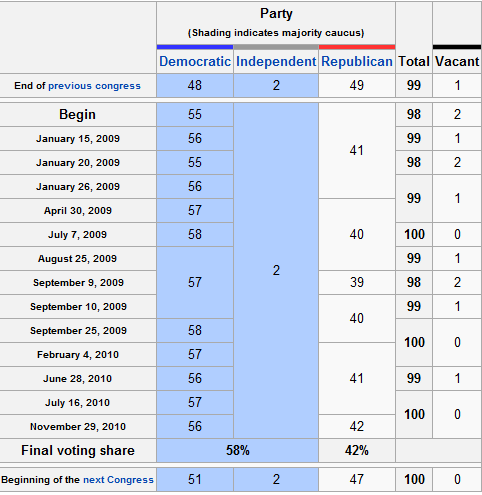 Did The Democrats Ever Really Have 60 Votes In The Senate, And For How Long? Once again in the wake of the President’s immigration policy announcement on Friday, one refrain you’re hearing from critics is that the President never pursed comprehensive immigration reform when had a Democratic Congress. Of course, as we all know too well, having majority control of both house of Congress doesn’t necessarily mean much if the opposition in the Senate decides to filibuster your legislation, and without a consistent caucus of 60 votes to overcome a cloture vote, legislation can be effectively blocked. So, to the extent there was a filibuster proof majority in the Senate it lasted during two brief periods which lasted for a total of just over five months when counted altogether (and Congress was in its traditional summer recess for most of the July-August 2009 time frame). It’s important to keep this fact in mind when discussing what could have happened in the 111th Congress, I think, and it’s probably something I haven’t kept in mind myself in the past. That’s a pretty thin 60 votes. No defections allowed and both independents required for every issue. 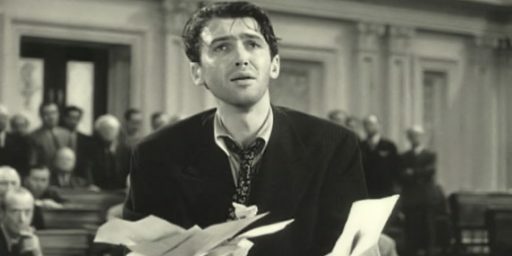 For a true filibuster-proof congress, you’d probably want sixty-some in a majority. Would Martinez, Collins, Snowe and Murkowski have filibustered a comprehensive immigration reform package? Seems to me that the entire premise here is off base. Except I believe you break a filiubster with three-fifths of the Senators duly chosen and sworn, which sometimes means 60 votes, sometimes less. Obama followed Reid’s lead in delaying a vote on the issue until the lameduck session, which appears to have been bad strategy, unless Reid knew he would not have the votes before then. Also when considering what is possible legislatively, one has to remember that a bill has to be passed in both chambers in identical form. It takes time for legislation to be drafted, vetted in committee, and then make it to the floor action stage. This is not a process that can be fired up and deployed quickly, especially when we are talking about major legislation. 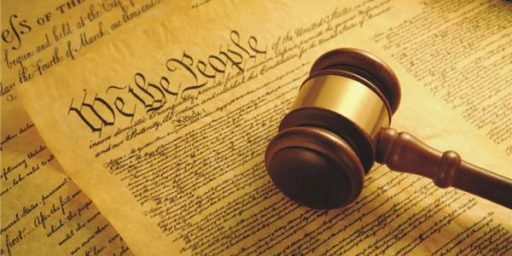 Indeed, one of the things that I think most Americans don’t fully appreciate is the utterly complexity of the legislative process. It is a tad more difficult (to put it mildly) than the “I’m Just a Bill” cartoon of the typical flowchart in an American government text. This points to one example of how Mitt Romney is repeating blatant lies on the campaign trail, and not being called on it by the press. Doug, for example, refers to certain “critics” who claim the President did not push immigration reform, then he quickly slides into a discussion of when and if the Dems ever had a filibuster-proof majority – without making much of a bridge between the two issues. The connection, of course, is that part and parcel of the GOP critique is the false claim that the Dems had two years of filibuster-proof majority – a claim that is pretty much a standard part of Romney’s stump speech, or at least something I have seen several clips of him saying. Isn’t that the most newsworthy aspect of this issue? @Doug Mataconis: @Steven L. Taylor: Thank you. I constantly see the refrain that the Dems had majorities in both houses yet failed to pass thus and so. The fact that Mitch McConnell had effective veto power over anything Obama, Reid, and Pelosi attempted is something the Rs try hard to push down the memory hole. And they seem to have succeeded with the feneral public. At some point we have to deal with this anti-constitutional de facto supermajority requirement. But I fear we won’t unless the GOPs go into ’13 with 50<X<60 seats. Since Snowe joined in the filibuster of a health care bill that she had supported in committee, the premise is entirely on base. There is plenty to criticize about President Obama’s relationship with Congress and his seeming inability to influence the legislative agenda. Much of it has come from Democrats, and I suspect we’ll here more of it once people start looking back and evaluating the Obama Presidency. NINE MONTHS!!!! I hope that Conservatives will remember Norm Coleman’s absolutely despicable (though legal) actions before complaining about Democrats “whining” about legimate election results. btw… I was counting from the date of the election (if we’re looking for swearing in, it was still seven months too long).